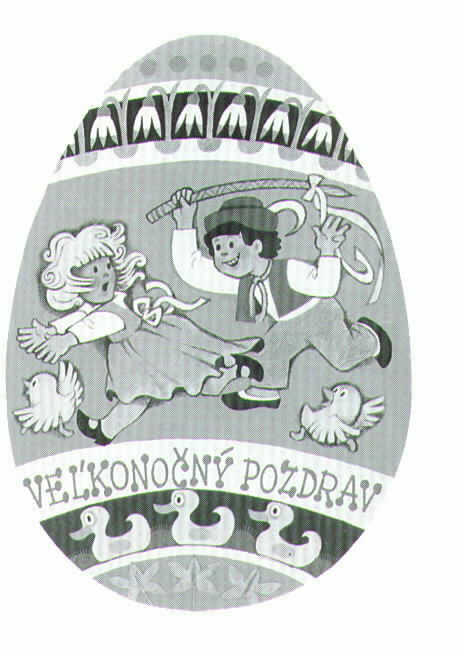 Among Slovak Easter customs, dousing and whipping are generally known. The current image of Easter, as we know it, is far more simple and unified, unlike customs from the first half of the 19th century when there were noticeable differences between individual areas. In some areas people performed both customs, dousing and whipping. In the village small boys went to whip girls and women on Easter Sunday, even in the twenties of the last century. It was mostly housewives who were whipped, as it was believed this would prevent them from being covered with dust. As a reward for “whipping”, the housewife offered the boys Easter eggs or poppy seed cakes. Adult men preferred to stay at home, as any woman who encountered them outside would whip them. On Easter Monday the boys continued their whipping. In another region boys whipped girls, the maidens of their heart’s desire, on Monday with a whip made from eight willow twigs, or braided branches (korbac). The girls would hide and it became a game of hide and seek. The next day, girls would go to douse the boys. In some regions boys went whipping on Monday immediately after midnight. If they were not allowed into a house through the door, they went inside through the roof. First they whipped the girls and then they doused them. After that, they were offered meat, white cake, and Easter eggs by the girls. On Tuesday, girls with buckets filled with water hid behind fences, under windows and various other suitable places where they waited for boys and men under fifty years of age to be doused. However, for this dousing they did not receive any rewards. After World War II the custom was established that when a boy went to walk his girl home, she would give him Easter eggs and an embroidered scarf. For other folk customs see our book, Slovak Folk Customs and Traditions.